At Street House Farm near Loftus in the Tees Valley, is a prehistoric monument that contains burials from both the Neolithic and Bronze Age. The original monument was built during the Neolithic and consisted of several phases of construction, including a burial mound with a timber façade and finally a rectangular shaped burial mound. During the Bronze Age, a circular cairn was constructed over the top of the site of the Neolithic mound. Cremated bone was found in both the Neolithic and Bronze Age monuments. A large quantity of pottery was recovered from both the Neolithic and Bronze Age monuments. Amongst the Neolithic pottery were the remains of a large Grooved Ware pot. Not enough survives to tell us how large the pot originally was, but it would seem that it was a barrel shaped. 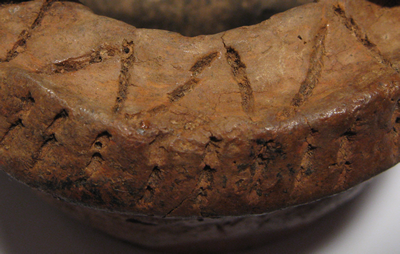 The pot was very simply decorated compared to other Grooved Ware vessels, with incised grooves on the body of the pot, incised triangles at the top, and impressed dots on the inside of the bevelled rim. Amongst the Bronze Age pottery was a miniature vessel, also known as an accessory cup. Only the very top of the vessel was decorated, with a series of linear stab marks around the top of the cup and a zig zag pattern made of twisted cord on the top of the rim. At only around 5cm tall, this pot is probably too small to have been particularly useful, and like many other miniature vessels, their original function is unclear. This pot may have been made to be purely decorative and have no real use. Perhaps the people that created the round barrow at Street House Farm saw pots as not just being useful, practical objects, but also as being attractive objects as well. Vyner, B. ‘The Excavation of a Neolithic cairn at Street House, Loftus, Cleveland’ Proceedings of the Prehistoric Society 50: 151-95. The pottery is currently held by Tees Archaeology.